Festivals are a vital element of our school curriculum and community. It is a time for us all to come together to witness students in public performances and participate in celebrations. Many of our festivals are based on traditional holidays ( Halloween, Thanksgiving, etc. ), while others are specific to Waldorf pedagogy (Festival of Lights & Courage, The Rose Ceremony, & Lantern Walk), and others focus on themes (Harvest Festival of Gratitude, Winterfaire, Grandparents & Special Friends Day, & Santa Lucia). Each festival conveys a mood, an attitude, and an experience uniquely suited to the season changes. Michaelmas is not just a special day set aside for an early fall festival; it is a season that extends from September 29, the Feast of Knight Michael, to October 31, All Hallows Eve. It is a time for celebrating deeds of strength and courage by facing challenges, symbolically dragons, both external and internal. It is a time for harvest, a time for work, a time for storing away that which we need for the cold dark months to come. Michaelmas is celebrated at Pine Forest through storytelling, puppetry and skits. It has become traditional for the second and seventh grades to prepare and present a Knight Michael skit, historically St. George and the Dragon. Another tradition is the grades children playing games during the festival which require feats of skill and courage. Classes may make dragon bread. The eating of dragon bread symbolizes both the overcoming of the dragon and the assimilation into our own beings the wisdom and power of the natural world. Our Michaelmas celebration evolves from year to year as we strive to make it a meaningful and living experience for all our students, young and old. Each November when the winds has taken the leaves from the trees and the air is crisp and chill we have a Lantern Walk to celebrate Martinmas, a festival of inner light in the outer darkness of the approaching winter. St Martin was a soldier in Rome in the 4th century. Legend says that one wintry night he met a poor beggar, half-naked and freezing. Martin removed the heavy military cloak from his shoulders and, drawing his sword, cut it in two, and gave half to the beggar. Marin became the patron saint of beggars, drunks and outcasts, dedicating his life to assisting pariahs. Celebrating Martinmas at PFS serves as a reminder that each of us has a divine spark that we must ferry out into the world and share with others. The children hear the story of St. Martin, sing songs and, as darkness falls, venture out into the night with their lanterns walking along a path lit with glowing luminaries, carefully carrying their lanterns in a mood of quiet peacefulness. Celebration of the Winter Season, this festival is said to have originated with Bavarian farmers and was introduced by a German nurse, a student of Rudolf Steiner working in the original Swiss curative home at Sonnenhof, in 1925-28. The simple form of the spiral, the beauty of the garden, and the group singing, all work together to enliven the spirit of the season: reverence and love. In a darkened room, all will enter in silence. A pine bough spiral will grace the floor and candles will glimmer. Songs of the season will be sung and the teacher will tell a special story. 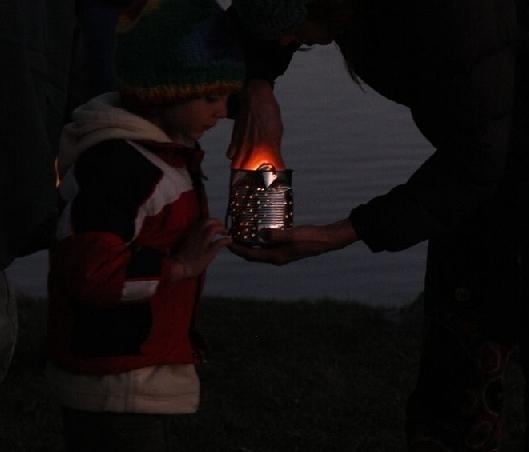 Each child will walk the spiral alone in the darkness, carrying an unlit candle placed in an apple holder. Gentle music will play as the child progresses toward a young girl who will sit in the center of the spiral with a glowing candle. The child’s candle will be lit when he/she reaches the center. Then the return journey begins. The child will leave his/her lit candle on the spiral and then return to his/her seat. As each child walks the spiral, the room grows brighter and the beauty of the group effort is seen. This deeply moving festival symbolizes the journey we all make as we approach the darkest night of the year, and also speaks to us of our over-all journey here on earth. The outward journey symbolizes what happens once our little light is kindled and we move out into the world on the path of our lives, making our own choices. The people of ancient Rome celebrated the first day of May by honoring Flora, the goddess of flowers. Flora was represented as a small statue wreathed in garlands. A procession of singers and dancers carried the statue to a beautiful blooming tree. May festivals spread to other parts of Europe. From early times, the English custom of “bringing in the May” meant roaming the countryside before dawn, gathering blossoms and branches to decorate houses and Maypoles. A towering Maypole was set up on the village green. The pole was usually the trunk of a tall birch tree, decorated with spring flowers. Villagers sang and danced around the Maypole in colorful costumes, often with wreaths filled with flowers adorning their heads. May Day celebrations originated in ancient times as a way to express joy and gratitude for the renewal of spring. People throughout the world are celebrating this day with a variety of traditions. But whatever traditions have developed, the inspiration is the same: cultures have always been thankful for the return of spring. We believe that communal celebrations of the seasons are important in our lives today, as much as they were in ancient times.